In August (!) I wrote a post on full lives and trying to do the next right thing. Just out of college, God started calling me to community ministry, a "ministry" I now know is called neighboring: being intentional with your neighbors in the places God puts you. I spent the next several years learning what it means to be a neighbor, how to really love and serve, and growing in faith. God spent a lot of time teaching me about true hospitality and the ministry of seeing -- especially seeing those the world too often overlooks. Three years ago, I started working in a lower socio-economic neighborhood in Marietta, whose residents are mostly immigrants, running a summer day camp for kids through a local church. We called it "Kids' Club" and spent the summer playing games, coloring, and learning about Jesus. I fell in love, and began looking for a place to live in their neighborhood. Almost 2 years ago, myself and a couple of friends moved into an apartment complex in their neighborhood. We wanted to spend more time with the kids we knew from the summers and get to know their families, to build friendships that were bridges across too many divides, to be and dwell. We wanted to be neighbors and to form community. As we got to know each other, many ladies asked us two things: can you help our kids with their homework, and can you help us learn English? So we did. We started homework help & tutoring for elementary kids, and an English conversation group for a few of the moms. And after the kids were amazed that we had actual books in our home, we started a library for them as well (thanks to y'all's donations!). Each of these things has grown. We see about 20-30 kids every week for help with their homework, and we have a few moms coming more regularly for English over brunch on Saturdays. Being a neighbor here has also meant helping with food and clothes and baby supplies at times, studying for citizenship tests, and helping navigate school systems -- or other systems. But it's mostly meant TIME. Spending time coloring and talking on the porch with the kids, watching movies, playing soccer (or anything else), eating together...investing in each other. It's meant friendships: full of laughter and tears and celebrations and smiles. It's meant listening and learning, taking a backseat and following others. It's meant seeing and moving and acting. And now it's time to grow. We're looking forward and taking steps to do that -- in our neighborhood, and in others. And we need your help. Over the last two years, you have come alongside us and supported us in a variety of ways. You've prayed over us, given financially, provided food for the kids and families, jumped in when a need came up, donated books (and lots of other things), and volunteered your time. 1) Pray. Pray specifically for the friendships we're building and for new relationships to be formed. Pray for us as we continue learning a new language. Pray for new doors to open and for new opportunities to serve, learn, love, and be neighbors. Provide for current tutoring, but also begin offering it for students through high school. At this time, there is nothing in the neighborhood for kids over elementary age, and we'd love to see that change. Teach English. Your support will help us invest in a real curriculum and offer more classes. Keep summer camp going. This is a huge undertaking, and isn't possible without your help. Training, specifically language learning. 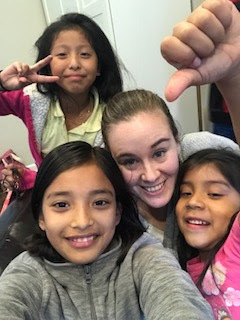 Your giving will help us continue learning Spanish, so that we're better able to have friendships, be neighbors, and serve. Other training includes learning from people who are farther down this road, research, and potentially attending conferences or meetings to keep growing in knowledge & experience. Open doors. While there are a lot of things we'd love to do (and hope to one day), a few of the things we're looking at are mentoring, boys & girls clubs, beginning summer camps and homework help in other neighborhoods, and special events, such as block parties, meals, and holiday and back to school events. Your donations will also help us establish a website, pay for marketing, and support me as a missionary to our city. 3) Volunteer! Come join us and meet the kids & their families. See how God is moving in these neighborhoods, and how He wants us to join Him. I promise, you won't regret it; our neighbors will capture your hearts and move you, just like they have ours. Please pray over how you can join us and continue coming alongside us. If God leads you to give, there are a couple of ways. We have a PayPal account where you can donate online, which is linked below. You can also make an in-person donation -- just contact me for details! I would love to share more with you about what God is doing in our neighborhood and city, and about how you can be involved. Thank you for your support, encouragement, and prayers! *When we registered the paperwork, we registered under Brooke Akins Ministries, in order to simply get the process going. We are changing the name to better reflect the heart behind what we're doing. **Tax deductible status pending 501(c)3 approval from the IRS. One of the things I love most about my birthday is that it falls so close to the beginning of the year. A new calendar year and new life year start together. I also love that I share a birthday with Kate, Duchess of Cambridge. I've thought a lot about this year and what it would be like. Not because I've now officially hit my mid-30's (oh my goodness, really??) but what will 2019 and 34 hold? The last two years have been the hardest I've faced. Everything felt like it was breaking to pieces, and I was never fast enough to gather them all up before they landed, or good enough to keep everything together. These pieces were significant chunks of my identity. Things (and people!) I had placed a lot of value in, that I thought defined me, were gone. Slowly, suddenly, systematically, chaotically. It felt very much like I was being stripped away, and that there wasn't much else there. That's how my prayer ended this morning. But it's those intangible boxes I'm talking about. The boxes that tell us who we are, or who we should be. The boxes society dictates to us, based on innumerable factors. The ones we put others in so we can try to understand them. The ones we put God in so we can try to understand Him, which is a fruitless task as He's infinitely beyond our understanding.